The Pathfinder Roleplaying Game is an evolution of the 3.5 rules set of the world’s oldest fantasy roleplaying game, designed using the feedback of tens of thousands of gamers just like you. Players need only the single 576-page Pathfinder RPG Core Rulebook to play, while the Game Master who controls the action will also want the Pathfinder RPG Bestiary, a massive tome containing more than 350 fantastic foes for your adventurers to face. 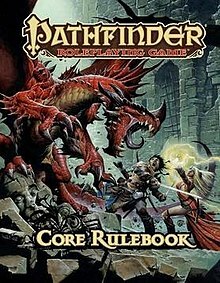 The Pathfinder RPG is a fully supported roleplaying game, with regularly released adventure modules, sourcebooks on the fantastic world of Golarion, and complete campaigns in the form of Pathfinder Adventure Paths like Council of Thieves and Kingmaker. Pre-registration is recommended for all Pathfinder events. Pre-register here.